Born in 1659, Henry Purcell was the finest and most original composer of his day. Though he was to live a very short life (he died in 1695) he was able to enjoy and make full use of the renewed flowering of music after the Restoration of the Monarchy. In the Chapel Royal young Purcell studied with Dr. John Blow. Dr. Burney, the eighteenth century historian, is amusingly skeptical on this point: "..... he had a few lessons from Dr. Blow, which were sufficient to cancel all the instructions he had received from other masters, and to occasion the boast inscribed on the tomb-stone of Blow, that he had been 'Master to the famous Mr. Henry Purcell'." 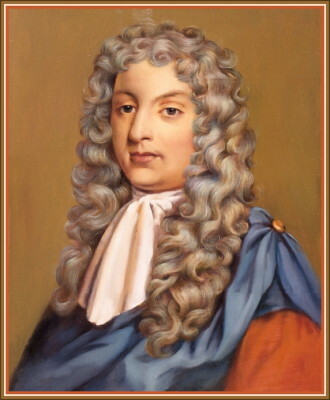 Legend has it that when, in 1679, Purcell succeeded Dr. Blow as organist of Westminster Abbey, the elder musician stepped aside in recognition of the greater genius, and it is true that on Purcell's death in 1695 Blow returned to the post, and would write a noble Ode on the Death of Purcell. In addition to his royal duties Purcell also devoted much of his talent to writing operas, or rather musical dramas, and incidental stage music; but he would also write chamber music in the form of harpsichord suites and trio sonatas, and became involved with the growing London public concert scene. Indeed one of the most important musical developments in Restoration London was the gradual establishment of regular public concerts. Even the few meetings that began as private concerns were eventually prevailed upon to admit the general public, such as the group that gave concerts in the Castle Tavern. Whereas other organizations charged only a shilling, their admittance fee was more than twice that sum, and before long they had enough capital to equip a music room in York Buildings. By the time Henry Purcell began to attend such concerts in the 1670s there were many highly skilled players of the violin, cello, and flute, as well as exponents of the (for London) relatively new art of playing continuo instruments, the most usual being the organ and the harpsichord. In 1683 a group of gentlemen amateurs, and professional musicians started a "Musical Society" in London to celebrate the "Festival of St. Cecilia, a great patroness of music" which any music-lover so desirous may still celebrate yearly on November 22nd. They asked Henry Purcell, then only 24, to be the first to write an Ode for their festivals; Purcell was to compose two more such Odes for the Society. The writing of incidental theater music seems not to have been regarded by Purcell as embarrassing or beneath his dignity as Organist of Westminster Abbey. He was in the very midst of a tradition that not only permitted but actually encouraged well-known church musicians to provide lighter music for the theatre and opera, and this was an accepted practice in the great continental cities as well as in London. Most of Purcell's theatre music was written between 1690 and 1695 (the year of his death), and within that relatively brief period he supplied music for more than forty plays. Much of the instrumental music was published in 1697, when the composer's widow compiled A Collection of Ayres, Compos'd for the Theatre, and upon Other Occasions. This body of music, viewed as a whole, shows that Purcell gave to the theatre some of his happiest melodic inspirations, distributed among solemn overtures, cheerful or pathetic airs, and delightful dances of every imaginable kind. There is hardly a department of music, as known in his day, to which Purcell did not contribute with true distinction. His anthems were long since accorded their place in the great music of the church; there are enough fine orchestral movements in his works for the theatre to establish him in this field; his fantasies and sonatas entitle him to honor in the history of chamber music; his keyboard works, if less significant in themselves, hold their place in the repertory; his one true opera. Dido and Aeneas, is an enduring masterpiece, and his other dramatic works (sometimes called operas) are full of musical riches. And, most especially, Purcell's songs themselves would be sufficient to insure his immortality. His sensitivity to his texts has been matched by few masters in musical history; when he had worthy poetry to set, he could hardly fail to produce a masterpiece.